"Light and hearty and full of flavor." Bring a large pot of lightly salted water to a boil. Cook the bow-tie pasta at a boil, stirring occasionally, until about halfway cooked, 5 to 6 minutes; drain. Heat olive oil in a skillet over medium heat; cook and stir sausage in the hot oil until browned and cooked through, 5 to 10 minutes. Add red bell pepper and onion; cook and stir until onion is softened, 5 to 10 minutes. Stir tomatoes, beef broth, and Italian seasoning through the sausage mixture; bring to a simmer. 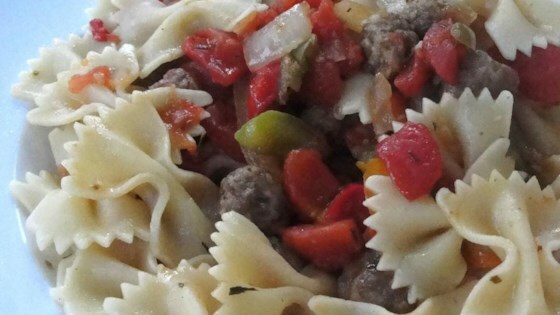 Add bow-tie pasta to the sausage-broth mixture; simmer until pasta is cooked yet firm to the bite, 5 to 6 more minutes. This hearty baked pasta casserole stars Italian sausage in a rich tomato sauce. Absolutely love this dish. It really is light and hearty. Seems like I make it once a week!!! Super yummy! I didn't have beef stock so i used chicken stock and it came out very tasty. My family loved it! It was delicious! My family loved it! I did not make any changes in the recipe, great just as is. Love this recipe! Would not change a thing.